Unlike other rapid growing areas in eastern Ipoh, the west side which include Jelapang, Silibin, Buntong, Falim & Menglembu is moving at slower pace. Although housing projects are running here but commercial development does not catch up accordingly. First Garden, which is one of the largest housing estates at Ipoh west, also seen to be left behind as compare to Ipoh Garden & Bercham. However, with the population continue growing at its surrounding areas, new commercial project seems to be popular & attracted some chained stores moving in to fulfill the demand. Since the opening of GP food center, it's neighbouring shops are getting attractive and the night become lively nowadays. Apart from restaurant, cafe, cyber center, there are also boutiques & education center operating here. In a gathering at Hokaido Cafe, Menglembu, a cup of coffee is served. 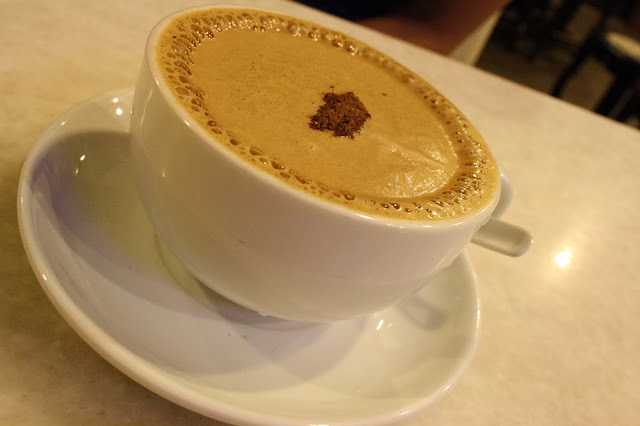 This is nothing much than an ordinary coffee but the appearance on top catches my eyes. I am not sure it is purposely or just coincidently made, the bigger bubbles are concentrated at circumference of the cup. Or it could be just a normal phenomena on a stirred coffee that I never pay attention to it in the past. There are constructions of larger scale commercial building around Ipoh lately. Although these are not super skyscrapers or grand buildings, but are relatively large structures compare to normal buildings in the city. Right in front of the famous Chinese restaurant, Pusing Public Seafood Restaurant (布先民众海鲜酒家) at Verasamy Road, construction of a commercial building is underway. It is built on a vacant land that used to be a car park mainly serving customer of the seafood restaurant. The building consists of 3-storey shoplots & an 8-storey office block. It seems Kampung Jawa is commonly locating buildings at 8-9 storey, such as Ipoh City Hotel, Grand View Hotel & two commercial plazas by Teh Teng Seng Group along Cockman Street. It's a cloudy evening and normally a right condition to see nice colorful refraction of sunlight from the clouds. While stopping in front a shop at 1st Curve, I am a little bit slow to capture the best moment. I only able to get this photo with color started fading away. Well, when uploading this post, I find difficulty to exactly categorize this area. Should it be part of Menglembu, Buntong or Falim? Or suppose this is considered a session on its own, call it Desa Rishah, 1st Curve or Kledang? When Syuen Hotel opened in 1993, it was the most luxury hotel in town. Although the shape & appearance of the building looked a little funny (some described it as a huge cage), its main entrance is built grand like a palace and Ipohites were amazed with this only 5-star rated hotel in Ipoh during that time. Over the years, I heard feedback of visitors from outstation or overseas, the hotel maintenance was not really up to par, indeed it is still one of the best choices of accommodation in the city. 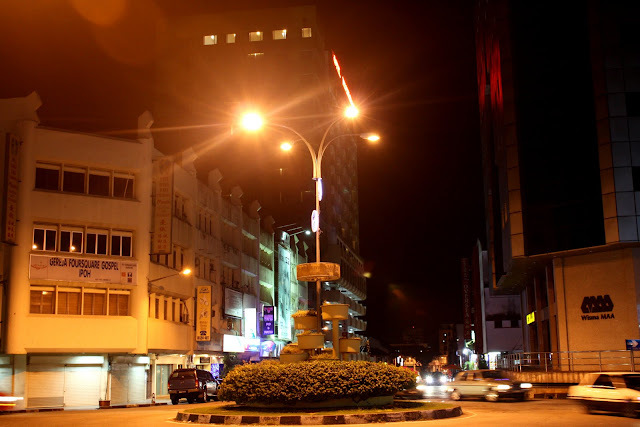 Added with the advantage of location at walking distance to Ipoh Parade Shopping Mall, famous restaurants at Greentown & city center, Syuen Hotel would be still a recommended hotel for staying in Ipoh. 88, Jalan Sultan Abdul Jalil, 30300 Ipoh, Perak, Malaysia. It was warm and no rain in the past few days. Everyone was thinking the hot days would come, but it seems the weather is really hard to predict nowadays. 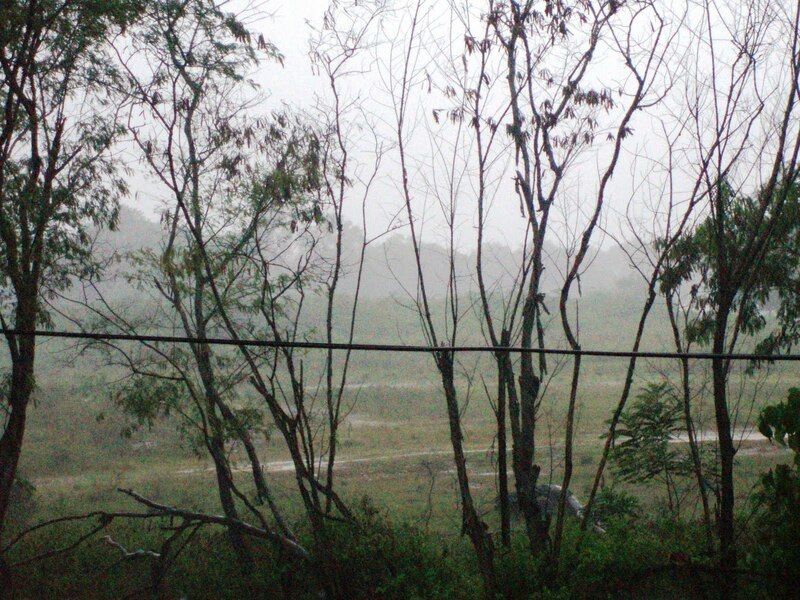 A storm in the afternoon swept through the valley and downpour at many areas around Ipoh. Objects at distance are disappearing in the rain. Most of the buildings in Old Town are reaching a century old. The civilian shop houses are not as lucky as the civil grand structures such as Town Hall & Railway Station that are duly maintained. Deteriorating heritage buildings are everywhere in Old Town while many had been torn down & replaced by new one. Most of the remaining are also not in good shape. When standing close to one, I find it was indeed finely made, finer than many modern structures in town. By looking at the present trend, I am not confident that the same scene in this photo will be available few years down the road. Sunny-day rainy-night is an appropriate description to describe the recent weather condition in Ipoh. When approaching Chinese New Year, which typically a warm & dry season in Malaysia, I believe the weather will gradually change in the coming weeks. Anyway, climate change in recent years may tumble our prediction. After a sunny day yesterday, some areas in Ipoh were raining at night, including Klebang. This morning appeared to be cool & partly cloudy. On my way to work, I witness this moment of first shine on the valley when the sun rises over the shield of Titiwangsa Mountains. Spinning colorful fan is now quite commonly seen around Ipoh as a simple and low cost way to draw people's attention on a particular shop or outlet, apart from banner and signboard. It is also a decorative item in some kindergartens & schools. Probably some better ideas shall be derived from this simple fan that make use of natural power to generate auxiliary energy supply. The night in Ipoh become more charming with these artistic lamp post along Gopeng Road. It was installed several months ago from the Sultan Idris Shah Roundabout till the flyover at Tiger Lane. The "Y" shaped post is decorated with flowery pattern & a lighted Perak Coat of Arms. The array of these beautiful posts on the street is a best welcoming scene to all visitors entering Ipoh city from south. And when I drove along Tiger Lane recently, the entire road is also installed with these artistic lamp posts. This is an old restaurant that I know a cowboy door is still existing, Sin Seng Hin at Clare Street. The entire shop seems to be maintaining it's original design and the interior would make you feel like living in 1950's-60's. Although I have not visited the restaurant, so I do not have any idea about the food, but I love its nostalgic appearance. Normally weather would become warm & humid when approaching Chinese New Year. It is now about two weeks from the great day but we still do not feel the "heat", or in particular, it is sunny during day time but usually rain in the evening & night. In this Saturday night, I am caught in a shower. There are a lot of people at Ipoh Padang scattered to avoid from rain when it came in sudden. I am one of them that quickly jump into car and watch the downpour wetting the floor. Anyway, the rain stopped in less than an hour but making this Saturday night a cooler night. This four and a half storey building at the crossing of Anderson Road & Clare Street is now occupied by Kamdar, the nationwide well-known textile store. However, for Ipoh citizen above 30's of age, they should know this is originally a popular supermarket in early 1980's, so called Angel (安琪儿). That was the time Ipoh had few supermarkets like Beauty, Crescendo, Perak Emporium, Dayi & Kwong Fatt which were all operating in almost similar scale. When Angel came up, it was one of the largest among all & if I not mistaken, the first escalator in Ipoh is inside this building. During the time when I was a kid, we were so eager to go Angel to ride the escalator & also having ice-cream, which was not available in other supermarkets. For some years, Angel became a most welcomed name in Ipoh. However, the glorious did not last long. When Super Kinta rose with brand new shopping concept & facilities, Angel and other traditional supermarkets were badly hit and eventually sank. It has been so long from the closure of Angel and many thing about it has faded away in memory. Those I can remember clearly are the escalator, ice cream & my first watch that bought from Angel. Anyway, I lost it in a drain in front of school about a year later and the incident claimed so much of my tears. This morning was sunny. Buildings appeared to be sharper than normal under the brilliant shunshine. The Islamic Bank Building at Douglas Road looked prominent under the blue sky. It aged about 20 years, originally white in color & recently re-coated in beige. The building is quite unique with the mixture of Islamic & modern architecture. I remember a friend of mine from Seremban commented that Ipoh has many traffic roundabouts. I did not realize until she told me such. I started to count the number of roundabouts and compared with few other cities. Then I found out the statement is quite true, although we are not the champion. The number would be greater if to include few that had been removed and converted into cross road with traffic light system (such as roundabout at Maxwell Road-Anthony Road, Tiger Lane-Tasek Road, Pasir Puteh Road-Yang Kalsom Road, etc.). Anyway, this one in Greentown is apparently the smallest in Ipoh. During rush hours, traffic from Brewster Road & Clarke Street would be always congested. Despite the little effect to smoothen traffic in this area, it does serve as a good reference point when give direction to visitors whom do not familiar with Ipoh's road. Super Kinta Departmental Stores, a name that almost none of Ipoh citizen do not know. People normally call it Super Kinta or in Cantonese "Kan Ta" (近打) by only mention the word Kinta. This departmental store is a member of George Town Holdings which ran another retailing business in Penang, the well-known Super Komtar. If I remember correctly, Super Kinta started business in 1983, located at 2nd & 3rd floor of Ipoh Central Market, which is a square-O-shape building. Although as mentioned above it occupied 2 floors, but it appeared to be single floor under one ceiling. Therefore, the whole departmental store looked spacious & tall. This had made it significantly different from other supermarkets at that time, such as Angel's, Crescendo, Perak Emporium & Beauty that operated in multi-floor but narrow building. As a result, one after another of these supermarkets closed down in the competition. However, as the Chinese say, fortune is always taking turns (风水轮流转). After more than two decades of glorious era, Super Kinta finally faced its fatal challenge from the modern shopping malls, Ipoh Parade & Kinta City, during the end of 1990's. Apart from departmental store, the new malls provide more choices for shopping & entertainment, such as fashion outlets, cinemas, bowling center, restaurants, etc. Even Super Kinta practiced major interior renovation at interval of few years to keep it up to date, the building had limited its transformation to stay on par with latest trend & new customer expectations. Finally, Super Kinta ends its chapter around 2004. Since then we hardly see its name & logo appear in public, and after so many years close down, we even difficult to find its plastic bag nowadays. To my surprise, the alley I used to pass by frequently but I never realize that there is one last signboard of Super Kinta which shows the way to its main entrance still pinned on the wall of Ipoh Central Market building. I believe this logo has been faded away from many of our mind and hope these photos could help recall some of our memories about this legendary departmental store in Ipoh. About this logo, I find it to be apparently a symbolic presentation of the location of its sister store in Penang, the Komtar Tower, which also experience the similar fate of closing down. A Proper Way of Complaining? I was going to take breakfast in Old Town this morning. When I drove into Lahat Road, I found something unusual along the street. There are notices with photo of Perak's Chief Minister on it and written with some sentences pasted on the pillar of shophouses. I was really curious and decided to find out the answer after parking at nearby. When I approached to read the notice, it is written in three languages that appear to be a complaint from the people of a particular settlement regarding land ownership problem. It seems the residents are not happy with the way of government handling this issue by transferring the case among several departments without a conclusion. Anyway, I believe the notices would be removed by local authorities very soon. There would be no absolute answer of whether this is a proper way to make a complaint, but somehow a group of people are really caught in frustration. Hope the issue can be resolved in peace. The street is so called Theater Street because the first theater or cinema in New Town was loacted here. If I am not mistaken, it should be Capitol Cinema (京都戏院). The cinema is at the junction between Theater Street & Anderson Road. When driving along Anderson Road & Chamberlain Road from north to south, there are four old cinemas i.e. Ruby, Capitol, Rex & Majestic. Three of these cinema buildings still exist and all are converted into furniture gallery. However, Capitol Cinema has been disappeared from the horizon in an inferno at least 20 years ago . The site was left vacant and served as a car park for so many years. In 2010, the car park finally closed and give way to the construction of a 3 & 4-storey shop lot project. After almost a quarter century, the site is eventually welcoming a new building. Anyway, there will be no longer any trace about a theater along Theater Street. Capitol Cinema will be just a memory to the older generation & it only appeared in limited number of photos. There was an old bungalow at this location, the junction between Anderson Road & Green Lane (Jalan Dato Seri Ahmad Said) that used to be a furniture galley before its demolition. A new building is built here and it turns up to be an amusement center Summer Paradise that come with a western restaurant Folie Folie Cafe & Grill. The building can be seen from Tower Regency Hotel (as posted in 6-Nov-2010) with its striking neon lights. There are some karaoke rooms & a fun pub in the building while the restaurant is operating in a separate unit at its side. I visited the restaurant & karaoke once each and find this is quite a nice place for night life. I believe it also attarcts guests from Tower Regency Hotel which is just within few minutes walking distance. This building could looked like destroyed in a blast during battle. Well, this is not a war zone but the busiest main road of Chemor town. The trunk road connecting Ipoh with northern towns cut through the heart of Chemor and there are thousands of giant trucks or containers carrying all kind of heavy goods, such as timber, cement, bricks and so on, passing by here everyday. When I was out for lunch around here this afternoon, the traffic was extremely jam because the main road was closed. By no choice drivers were all directed into other streets as alternative route and all those big vehicles crawling in the narrow alleys were endangering other road users. But why the main road was closed? When I passed by here again after work, I realized there were 3 shophouses having their front portion torn down violently. Immediately it came to my mind it was caused by the collision by truck and later proven from the evening news that I was right. 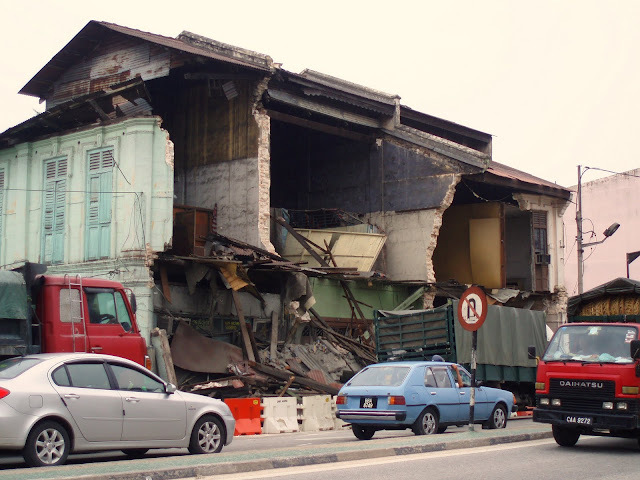 A truck came from northern direction lost control and slammed onto the five-foot-way at opposite direction causing the upper floor of these shophouses collapse. The truck driver was injured but luckily no other casualties in this incident. From this accident, it reminds me about another small town at south of Ipoh, Kepayang, which is similarly right on the intercity trunk road had been many times hit by trucks and forcing the residents either keep themselves safe by living only at the rear portion of the shophouses or simply move out from there. However, if similar incident happen again, it will be greater risk of civilian death in Chemor than Kepayang because Chemor is much more crowded and almost every building along the main road is occupied. Hopefully appropriate action will be taken to prevent any unwanted tragedy. Kinta Riverfront is a long term project to revive the glorious Kinta River after the collapse of tin market. On top of the 5-star hotel & luxury service apartment, something making it different from other development projects is the complete plan stretching few kilometers along Kinta River which consists of cafe, restaurant, landscaping, pedestrian bridges & even a mini museum. Although it is not world-class architecture, somehow the project at its completion is expected to beautify Ipoh city center. Also, the mini museum displaying tin industry, particularly in Kinta Valley, is a great effort to share the history of Ipoh's establishment & the hard work of our ancestors to grow this city from a small village. The master piece of this project, the luxury service apartment & hotel building, is progressing intensively. The apartment block has reached its top floor and is now one of the tallest buildings in Ipoh. It is also the second building after 28 years that achieves 20 floors, apart from Kinta Heights. However, it is probably at same height above sea level with other tall buildings, such as the 17-storey Tower Regency Hotel, because it is standing at a lower ground. By the way, the neighbouring hotel block is catching up and will reach almost the same height at its 19th floor. Ipoh public transport has not been upgraded for decades. After years of talking, finally we see some realistic changes. The existing city public transport companies join venture to run a combined service, so called Perak Transit. The process of transforming Ipoh buses from old to new will be carried out in phases. The first batch of new bus appear in pink color start runing on the road few months ago serving intertown routes. Hopefully the transformation will be conducted successfully to provide citizen of Ipoh a comfortable & safe ride. A new electronic screen being installed at the entrance to Bandar Medan Ipoh (commonly known as Ipoh Garden East). This is quite popular in other major cities in Malaysia. However, Ipoh's economic development is at slower pace. After the first electronic billboard appeared at Brewster Road many years ago, this is only the second in the city. Although the changing screen can display more advertisements compare to the still picture on conventional billboard, people moving on road may miss some images. The weather is mostly cloudy and rainy in the recent days. Direct sunlight only appear for short while or not even a single hour in a day. Anyway, a nice blue sky is seen this morning and lasts till afternoon. The skyline looked clear in the fresh atmosphere and under the brilliant sunlight. Government offices along Douglas Road (Jalan Panglima Bukit Gantang Wahab) have been closed since last Friday (a special holiday for Malaysia winning a regional football championship) and traffic in this Sunday is quite relaxing. However, the day ended up a thunder storm & downpour in the evening. Several lower grounds even suffer disaster of flooding. It seems we will continue dealing with the rainy days for some time. During the first moment in year 2011, brilliant fireworks lighted up the skyline of Ipoh. Crowds gathered at Kinta City Shopping Center's roof top car park to witness the welcoming celebration of new year. When the moment zero hour reached, explosions in the sky cheers everyone. 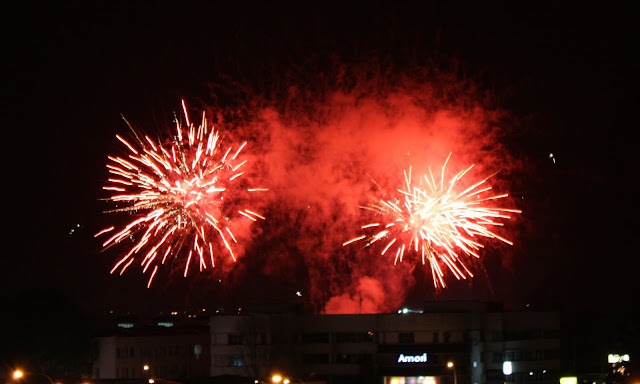 People at the roof top could enjoy a 270-degree view around the city and witness the flowery fireworks at different corners of the city, among those, government origanized fireworks at Greentown Ipoh Square (Dataran Ipoh) and Indera Mulia Stadium were the largest and longest. Although viewing from Kinta City was quite far, its beautifulness still amazed the audience. Nevertheless, the nearest firework explossions by nearby pubs shocked the crowd and won the applause.